I have taken part in the Australian Women Writers book reading challenge since its inception in 2012. I have decided to share some of the book reviews that I have written in the past on my website. I thought the best book to start with was the one that I read first for the challenge. Firstly let me tell you about how I came to receive the book. You see I found out that Jessica Bell lived in Greece and at that time I was still living in Italy. She very kindly sent me a copy of her book. I didn’t often receive post in Italy and we lived in the countryside up an unsealed white road. Our address had ‘locality’ in it and no fixed number. This had meant that we did have problems receiving some mail items. But on that December day the postman rode up to our mail box, got off his motorbike and looked rather indecisive about what he was going to do with the brown paper package in his hand. I saw him, and caught his eye, and with that he got back on his bike and rode up to the house. 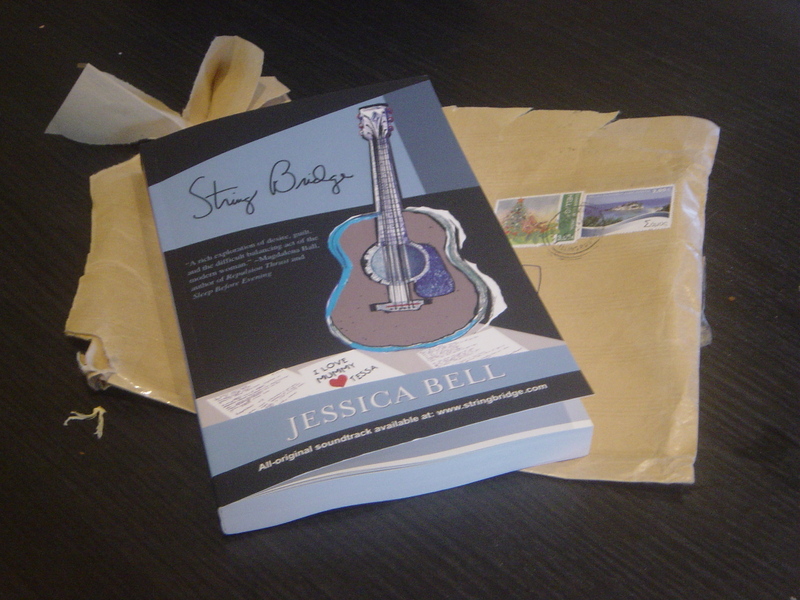 Within the brown paper package taped up with sticky tape was Jessica Bell’s book String Bridge. If you go to this link, you can see the book trailer. I highly recommend you do this as the song (Famous) is brilliant. It is Jessica singing the song. Her debut novel String Bridge is just fantastic. Her language is very descriptive where she talks about domestic drudgery. Take this line from page 50. ‘Routine is a monotonous exhaustion; an annihilation of the desire to differ. It humiliates the soul, kills passion’. The book traces the life of Melody Hill, an Australian who lives in Greece, Athens with her Greek husband and her daughter Tessa. I felt like I was journeying with Melody. Melody is disgruntled with her life. She feels she doesn’t want to be just a wife, mother and career woman. What happened to the musician that she was, when she met her husband? Jessica Bell explores the relationships between mother and daughter, not just Melody with her own mother, but also with Tessa. She also explores her relationship with her husband, the ups and downs. She reaches a conclusion and then something terrible happens. At this point, as I was reading, I was utterly moved, and indeed crying. I am not going to spoil the story here, instead I urge you to read the story of this young woman and her identity struggle and her bouts of depression. Jessica has been extremely busy since her debut novel came out. I suggest you head to her website and check out what she has achieved. She is certainly one busy lady! Jessica Bell grew up in Melbourne, Australia, to two gothic rock musicians who had successful independent careers during the ’80s and early ’90s. She spent much of her childhood travelling to and from Australia to Europe, experiencing two entirely different worlds, yet feeling equally at home in both environments. She currently lives in Athens, Greece and works as a freelance writer/editor for Hellenic American Union, Cengage Learning, Pearson Education, Education First and Signature Manuscripts. Jessica Bell’s poetry and short stories have been published in various anthologies and Literary Magazines. A full list can be found on her website. Additionally, she has written various English textbook materials and is also a singer/songwriter/guitarist. Ms. Bell’s experience as an Australian living in Greece has greatly influenced her writing. Jessica Bell has a Bachelor of Arts from Latrobe University, where she studied subjects such as modern English literature, fiction writing, nonfiction writing, screenplay writing, editing and publishing children’s literature, myth and ideology, and 18th-century romanticism. This entry was posted in Reading and tagged aww2012, book review by Cathy Powell. Bookmark the permalink.